WestJet has released a new ad to promotes its WestJet Rewards program and celebrate its status of proud partner of the Toronto Blue Jays. 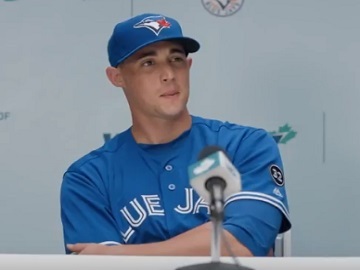 The 30-second spot features Toronto Blue Jays pitcher Aaron Sanchez at a press conference, where he was about to talk about his team partnering with WestJet for another season being interrupted by WestJet superfan Marci, who starts talking about the airline’s Rewards program. “You know, WestJet’s Rewards program is doing amazing things for the business traveler, ” she says, mentioning they use WestJet dollars instead of miles, “so it’s easy to understand”, and that, “if you fly a lot for work, you can use your WestJet dollars for family travel”. The commercial, also starring television play-by-play announcer for the Toronto Blue Jays, Buck Martinez, ends with Sanchez letting Marci to keep talking to reporters, which makes her really excited and willing to know which is the next question. Created by WestJet and their creative content agency, studio m, this is only one of the six new ads launched today by the airline and set to run on Sportsnet during Toronto Blue Jays games throughout the baseball season. WestJet urges you to perch yourself in the WestJet Flight Deck this season and catch the game from one of the most exciting sections at Rogers Centre, specifying that, if you don’t live in the Toronto area, is not a problem, as the airline offers 120 flights per day to Toronto from across Canada and the U.S. (select cities). WestJet Rewards program enables members to save on flights and vacation packages in multiple ways. For instance, members can now access exciting new partner destinations by taking advantage of the airline’s Member Exclusive fares, available only when redeeming WestJet dollars. Amsterdam, Paris, Rome, Sydney, and Hong Kong are only some of the Member Exclusive global destinations. A series of companion vouchers, milestone awards, awarded to members who reach $4,000 or more in 12-month spend, the chance to get up to 5% back in WestJet dollars on flights with WestJet partners, vacation packages and more, as well as the chance to earn WestJet dollars for online car rentals, hotel bookings and more are among the benefits a member of the WestJet Rewards program can enjoy. WestJet, named Best Airline in Canada and one of the best Low Cost Airlines in North America, has been the airline partner of the Toronto Blue Jays since 2012. Aaron Sanchez has starred in several other commercials, in one of them explaining the WestJet Rewards program from an ice bath.